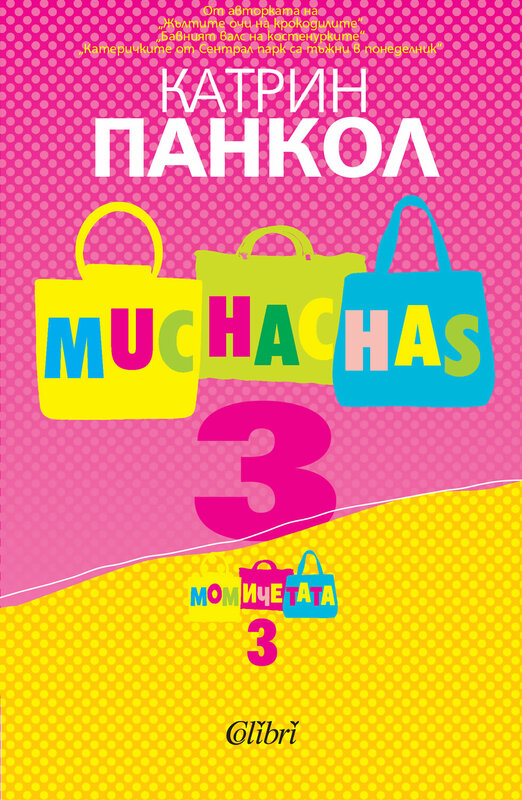 Four years after the three novels with colorful titles Bulgarian readers already know, Katherine Pancol publishes a new trilogy with the laconic name "Muchachas" (1, 2 and 3). In the third and final volume of the trilogy the fates of the characters gradually unravel. Stella and Josephine, who already know they are half sisters, finally meet. Stella is determined to take revenge on Ray Valenti with his last mistress Violet. Gary thinks he loves two muchachas but he will have to choose one of them. Hortense is obsessed with the fashion house and she plans to establish a partnership with the rich Elena. The big surprise here is the fate of the poor Ray Valenti. Katherine Pancol's insights into human psychology, and particularly women, are amazingly accurate and her sense of details often shaded with wry humor. Her gift to lift people's spirits while providing great entertainment has been key to her success, inspiring many women to dare to be themselves while keeping a positive relationship with life itself. Pancol (born 1954) is a Moroccan-born French novelist. While working for “Paris-Match” and “Cosmopolitan”, she is noticed by an intuitive publisher who encourages her to begin writing. Following the success of her first novel “Moi D'abord” (“Me First”) in 1979, Pancol moves to New York City where she spends the next decade pursuing creative writing and screenwriting classes at Columbia University while producing three more novels “La Barbare” in 1981, “Scarlett, si possible” and “Les hommes cruels ne courent pas les rues”. Her novel “The Yellow Eyes of Crocodiles”, published in 2006, has been a huge success in France, where it sold more than one million copies and received the Prix de Maison de la Presse, for largest distribution in France. The novel is the beginning of an extremely successful trilogy, published in Bulgaria. Katherine Pancol was also awarded “Best author 2007” by Gorodets Publishing (Moscow).